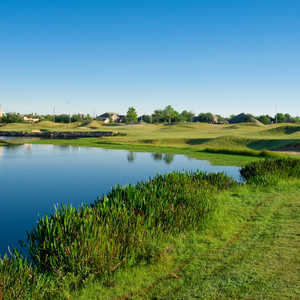 CYPRESS, Texas -- When PGA Tour veteran Peter Jacobsen and Houston-based Jim Hardy teamed to build a 36-hole, daily-fee complex on U.S. Highway 290 just 20 miles northwest of the South's largest city, Houston, they set a goal to be environmental stewards. BlackHorse Golf Club's North Course presents you with an opportunity to pull out the big stick all day. The environmentally friendly Blackhorse Golf Club in Cypress was designed by Peter Jacobsen and Jim Hardy, who teamed to build one of the best 36-hole, daily-fee facilities in Texas. They called it BlackHorse Golf Club -- a horse of a different color, is the theme. What you get when you visit here is classic golf. BlackHorse is traditional, long and should go down as a staple of first-class golf in the greater Houston area. "These courses offer every golfer the opportunity to play a challenging yet fair round of golf, no matter what their skill level," said Peter Jacobsen, a veteran of the PGA Tour. "The course details, layout and environmental use of the land make this a truly special course for Houstonians." "We designed this course to use the natural terrain and features of the area in order to challenge golfers of all levels. The use of the creek, lakes and wetlands, as well as the sand quarry (on the South Course), and magnificent trees make this course special among daily-fee courses. This club offers a premier golf experience for the public," Hardy said. The Jacobsen-Hardy environmental beliefs spurred them to save integrity of the land and surrounding environment and that enhanced its natural beauty. BlackHorse is no exception. Both courses are situated among live oaks, red oaks, water oaks, ash and elm trees, creating a golfing environment in a wooded setting. The trees were protected to minimize the effects on the land and to maximize environmental stewardship. BlackHorse Golf Club's North Course presents you with an opportunity to pull out the big stick all day -- even from some of the upper tees. The back tees are called "Big Jake", named for Mr. Jacobsen, and they measure 7,301. But one tee up you are still at 7,075, one more up is 6,812. The regular tees are 6,615. Normal "White" tees called "Men's Forward" and they come in at 6,199 yards -- all at par 72. The North Course's segment with the most character is no. 4 through the signature hole at no. 6, a 179-yard, par 3, from the back. The tee shot is scary because it has to clear an old oxbow with native palmetto growing in the creek bottom. The green is built up with railroad ties and there are traps left front and in the rear. Your natural tendency will be to play it safe and pull it right. Nos. 4 and 5 are sandwiched between wetlands with huge trees all around the outskirts of the two holes. The fourth is a 420-yard, par-4 challenge and no. 5 is 419. Finish the day with a beauty at no. 18. This 546-yard par 5 requires longer hitters to go left of some fairway bunkers. The second shot can be a lay-up to the left side of the fairway. The green is tucked behind a huge pond with a view of the new clubhouse. The BlackHorse fairways are TifSport grass, while the greens feature TifEagle. The wetlands, oxbows, palmetto and huge oaks attract birds such as ducks, egrets and sand hill cranes. The main feature of BlackHorse's South Course is a sand quarry that was creatively incorporated into the course design. 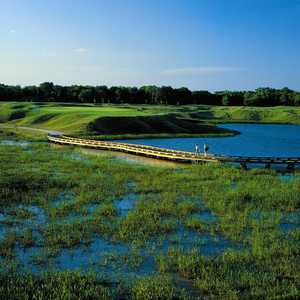 A dramatic expanse of sandpits and sand hills, along with wetlands grass, make holes no. 13, 15, 16 and 17 a challenging and beautiful walk. Jacobsen and Hardy feel the courses' playability will draw in loyal players and will create interest among new players of all ages. They call the "creative" tee distances another draw. "We designed the courses to offer challenging play without sacrificing enjoyment," Jacobsen said. "For example, each hole features six different tee boxes, giving players of different levels the opportunity to tee off from various distances." Redstone, Shadowhawk, The Houstonion, and now Blackhorse golf course is getting anew look, with a better sand in all of the courses.